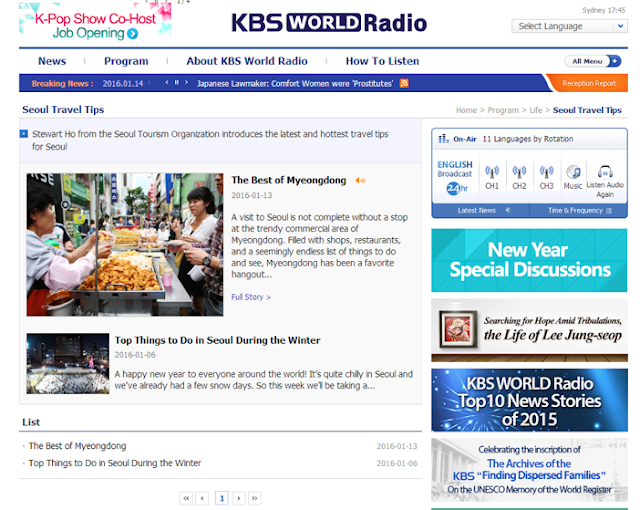 Musings: Listen Along to My New Weekly KBS World Radio Corner, "Seoul Travel Tips!" Since the start of the new year I've begun hosting a short, weekly corner on KBS World Radio. Representing the Seoul Tourism Organization, my new corner "Seoul Travel Tips" focuses on tourism in Seoul and specifically sharing on lesser known sites off the beaten path, hidden eating spots, new events, and other insider travel tips. Seoul Travel Tips airs every Wednesday and can be listened via the KBS World Radio homepage, podcast, RSS, etc and can be listened at anytime. The official Seoul Travel Tips homepage also has the script for each week's segment so you can catch all the information. It's also great for those wanting to practice or learn English. Though I've got a lot of improvement to do, please listen and share if you can!